Everything Obama has done he has done to make America weaker and more vulnerable. He is giving everybody of the world an opportunity to partake of the remaining wealth of our nation. This is why he refuses to deport criminals, allows sanctuary cities, restricts the authority and jurisdiction of the Border Patrol and I.C.E. America, once a super power, is now diminished and diminishing. He has “retired” our most knowledgeable and capable Admirals and Generals to make room for Obama compliant minions. He refuses to listen to the few experienced commanders remaining at the Pentagon, Department of Defense and in the field. 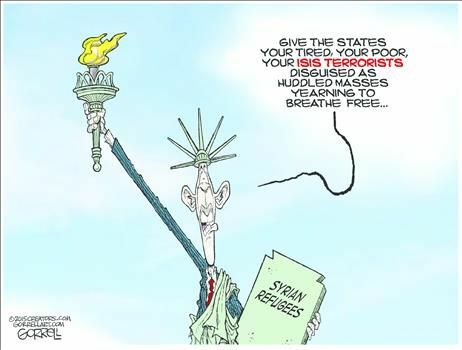 Why not veto the vetting of “refugees” with headlines like “8 Syrians caught at Texas Border” and “Honduras arrests five Syrians headed to US with stolen passports” and “In first six weeks of FY2016 we resettled 827 Somalis; all but one are Muslim” ? Makes sense to me. Now understand, I have nothing against people coming to this country to escape the mayhem in their homeland. I don’t understand why they run rather than defending themselves and their homes. Instead, they’re evacuating in numbers that would make up multiple military divisions (10,000 – 20,000 soldiers each). Certainly enough to put up a good resistance. But that may be just me. What bothers me, and bothers me a lot, is that we have no way of telling who they are or whether they want to be here just to do us harm. Paris was very accommodating to Muslims until the disguised radicals among them started killing French citizens by the scores. For years now I have ranted about people coming here uninvited and without verifiable documentation to prove that they are not cartel members, assassins, drug dealers, gang members or terrorists. It is now time to cast blind acceptance aside and start weeding the Garden of Complacency. Our lives depend on it! When Democrats are in charge, there is no need for gerrymandering. Without mandate or even authority, President Obama’s minions place “new arrivals” aka refugees, aka illegal aliens in specific districts and states changing the political makeup to favor Democrats. It’s Chicago politics squared. It’s despotic! He uses tax dollars to move imported refugees and invaders to areas of high Republican voters. Be they the Muslims with potential terrorist ties that he welcomes into the country or the masses invading from the South and assaulting our shores, they are guided to strategic areas of the country. He then authorizes them the ability to vote. Thus, redistricting is not necessary. He’s doing everything to secure the makeup of various voting districts rather than protecting the nation. When overloading a voting district isn’t enough, party members simply program voting machines or vote counters to elect Democrats no matter what box is penned or which chad is punched. Is anybody still wondering how 103% of eligible, registered voters in some districts voted Democrat in 2008 and 2012? (E.g. According to the League of Women Voters, four districts in Fulton County, Georgia [2/3 Democrat, 1/3 Republican] showed greater than 100% voter turnout in the 2012 election.) One hundred percent voter turnout is statistically impossible. Does it still concern you why some districts showed NO, none, not any, zero, zip, nada Republican votes in the 2012 election? Maybe the 2016 election is already in the bag for Democrats no matter who wins the nomination…of either party. But, then again, there are still months remaining before announcing the chosen ones and almost a full year to rig the election. In addition to the tens of thousands assaulting our southern border, we are accepting another 70,000-200,000 “refugees” from the primarily Muslim countries of Iraq, Somalia, Bhutan, Burma, Cuba, Iran, Sudan, Democratic Republic of Congo, Eritrea, Ethiopia, Afghanistan and, of course, Syria. This is not only a national integrity issue, this is a national security issue. By allowing the uncontrolled and unvetted influx of foreign nationals, we don’t know why the individuals are coming here. Is it for jobs, self-betterment, personal security, entitlements, to set off dirty bombs or simply to change the established voting patterns? Today’s journalists interpret the news and report it through their version of artistic representation. They identify more with the arts (symbolic portrayal) than factual accounting. News reporting of the current era is much like the Hollywood fulfillment of a preconceived outcome. Reporters, either conscientiously or unconsciously, start with their ideal outcome then try to write a story that justifies that idea. Since most actors in Hollywood and mainstream newscasters flair to the liberal or progressive mentality, the general public predominantly sees only that slanted side of events. Whether on air or in print, it is difficult to identify truth through the words used. That goes for the majority as well as the researched seven to ten percent who share a conservative bias. The only way for one to assure one’s self of truth or accuracy is to do some personal in-depth searching for both sides of any important issue. The general inclination is to accept what is presented without verification. Thus, we are being brainwashed as we blindly and ignorantly accept the subjugation. With like mindset, the stories are told and retold by newscasters. Often using the same skewed verbiage (aka talking points) without threat of being called for plagiarism. This ideological group-think is purveyed to the public as news. In actuality it is influencing behavior. The more times you hear the same phrasing from various sources, the greater the chances of acceptance. Ronald Reagan is often accredited for the phrase, “Trust but verify” that he used when speaking to Soviet President Mikhail Gorbachev. Actually, the phrase fed back to Gorbavhev is the English translation of the Russian saying, “doveryai, no proveryai”. That was then, this is now. Might I suggest that we verify before trusting? Just a little effort might make a big difference. There is just too much polarized influence to accept any first proclamation. See NUDGE THEORY posted on October 30, 2015 for more information about how your thoughts and ideas are influenced. PLEASE TAKE A MOMENT TO THANK ALL OUR ACTIVE DUTY MILITARY AND VETERANS TODAY AND HONOR THEM ALWAYS.